How has your week been. I worked around town this week, still busy, but not as much travel. 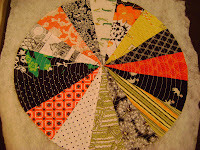 SOOOO I have had some time to sew! 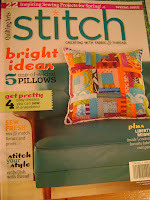 This Stitch magazine is really great, lots of ideas for home sewing projects and dressmaking. I started a project...yes another one, out of it, some cushions which if they turn out I think I will give to our oldest son and his girlfriend for their appartment. 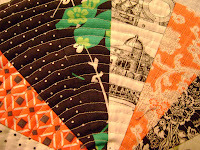 The quilting is a bit wobbly,but it just adds to the funkiness of them. Cool colours, don't you think. Then what might this be in the picture below? 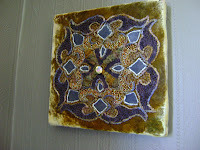 Also managed to get my tile finished and hung on the wall, I must email a picture of it to the tutor Jane, she will be very pleased, cos I am. 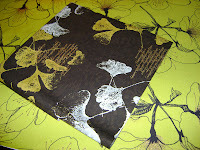 Fabulous spring day here, so I am off to spend the day in the garden, no sewing today! I've not been stitching today either,been having toomuch fun on the ski-field,see you Monday evening?